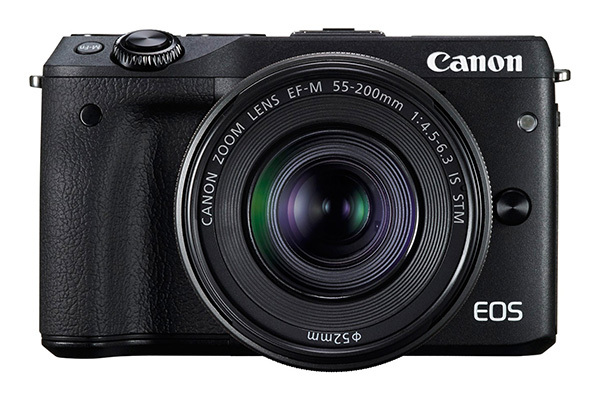 Canon was late to the CSC party, launching the original EOS M in 2012 and following up with the (Japan-only) EOS M2 in 2013. So, for UK shooters, the EOS M3 is the true successor to the original and is competing in a busy sector, occupied by many other brands. As three years have elapsed between the launch of the M and M3, users are entitled to expect new features, and Canon hasn’t disappointed. The pixel count has grown from 18 to 24.2Mp – an amount on a par with some DSLRs. A new-shape body and quicker AF enhances the M3’s appeal, but will this be enough to tempt buyers away from more established CSC systems? With its 24.2 megapixels, the M3 has made a big leap forward in terms of image resolution and dealt a blow in terms of pixel count to Micro Four-Thirds CSCs such as the Olympus OM-D range and Fuji’s X-series cameras, which all offer around 16Mp. Perhaps the M3’s biggest rival is the Sony A6000, which also has a APS-C size sensor and similar pixel count (24.3Mp). Supporting the sensor is Canon’s DIGIC 6 processor, which can also be found in the EOS 750/760D DSLRs and – albeit with dual processors – the acclaimed EOS 7D MkII. So, it boasts a great pedigree, and the new features continue with the addition of both NFC and Wi-Fi to allow for images to be paired to a smart device and uploaded in the field. Simply looking at the M3 will tell you there’s been some big changes to the body design, and this is where the most useful new features come to light. The body is thicker and gains a pronounced grip to make holding the camera a more comfortable experience. The touchscreen LCD is tiltable, replacing the original M’s fixed screen, and is designed to make awkward compositions a thing of the past. It can even be tilted 180° upwards to capture self-portraits. While the body is bigger, it’s still pocket-sized compared to DSLRs and larger CSCs, so doesn’t lose any of its portability. What’s more, the bigger body has allowed for the inclusion of a built-in flash. This extends the low-light shooting possibilities, and a new control dial makes changing exposure settings much easier. One missing feature that’s sure to divide opinion is the lack of a dedicated viewfinder. The Sony A6000 includes an EVF, but EOS M3 users will need to buy the optional EVF, which is available in a pricier kit bundle (it’s £699 with the added EVF accessory, or £599 without). Additional internal features include an option to expand the upper end of the ISO range from 12,800 to 25,600 and, as autofocus speed was a general gripe from original M users, there’s a 49-point Hybrid CMOS AF III system that Canon claims is six times faster in operation than the AF featured on the original EOS M.
The menu system is logical to navigate and easy to use. It will be instantly familiar to anyone that has used a Canon DSLR model. Even if you are a complete newcomer, it won’t take long to find your way around the various controls, so if you want a camera that you can pick up and start shooting with immediately, the M3 definitely ticks this box. The reshaped body makes the M3 comfortable to hold for long periods of time, and at 366g, the body is actually 30g lighter than the Olympus E-M10 (battery and memory card included). That said, the image-stabilised 18-55mm lens is fairly weighty at 210g, but this isn’t enough to unbalance the camera. The touchscreen LCD is both versatile and easy to use. Adjustments can be made quickly without having to go into endless sub-menus and, although we’ve seen it before, the ability to line up a scene and then tap the screen to select the point of focus and trigger the shutter speeds up operation no end. The clever screen also comes into its own after capture. Using it in the same manner as the screen on a smartphone, you can swipe to scroll through images or pinch to zoom in and magnify your shot. The hybrid AF system has certainly improved autofocus, but it can’t be described as bulletproof. Scenes in low-light conditions occasionally caused the focusing to hunt, but in decent light with higher contrast we didn’t experience any problems. A feature that isn’t so quick is the maximum burst rate, which has actually dipped from 4.3 to 4.2 frames per second. Write speeds are average too, with RAW files taking 1.4secs to write and JPEGs just under 1sec. One exposure mode worth a mention is the Creative Assist option. Allowing users to quickly tweak contrast, saturation and even depth-of-field settings produces Instagram-style filters that bring an arty feel to images with the minimum of effort. Although many of these effects can be added in post-processing software, photographers looking to capture a particular style can do it in-camera. As the M3 boasts a hotshoe mount, the CSC can be used with Canon or third-party flashguns, although the compact 270 EXII unit would balance better on the small body than the heavier 430EXII or 580EXII units. If you do try shooting in the studio, full Manual mode is easy to set up, with the front command dial adjusting shutter speed and the real control wheel adjusting aperture. A dedicated Record button allows for video footage to be captured using any exposure mode (including the trendy Creative Assist), although there is also a separate Movie setting on the Mode dial that controls shutter speed and aperture automatically. Priced at £599 with an 18-55mm lens, the M3 is also available in other bundles including a twin lens kit for £968 that adds the wide-angle 11-22mm f/4-5.6 IS STM optic. Although it is sensibly priced, the Sony A6000 can be found for around £50 less, while the all-weather Nikon AW1 is pitched at the same price and can be used underwater. For existing Canon users, the inclusion of the EF adaptor that allows DSLR lenses to be used would have enhanced the value. This has to be bought separately for £99 – although a search may find second-hand options at a lower price. Because the ageing EOS M is nearly three years old, the arrival of the EOS M3 needed to deliver a knockout blow. While the handling and ease of use are certainly there, the autofocus, while much improved, could still be faster. Overall image quality is decent too, but those with ultra-critical eyes would be looking for a little more detail. The M3 is definitely a massive improvement over the original M and offers stacks of useful features that make a real difference out in the field. While it’s not a ‘bargain’, it is reasonably priced, but if you’re a Canon DSLR user it makes sense to buy the EF lens adaptor and integrate this camera into your existing system.